“On weekends, we brunch…” but let’s be honest, there are some weekends when you just want to do absolutely nothing! You know, those messy hair, braless, don’t-get-out-of-your-pajamas all day kind of weekends where cuddling with “bae,” or curling up with a good read, or just cozying in the sheets with Netflix is the only thing on your weekend agenda. Well the Saturday I ended up at Fig & Olive was intended to be one of those days. It was a gray and dreary Saturday morning and there was nothing I wanted more than to spend the day in bed with Dermel. We successfully accomplished a lazy morning in, but once noontime rolled by and the stomachs started to growl, we realized that it was about time we got something to eat. Neither of us willing to break the lazy spell and actually prepare food, we decided to venture out for a few hours to get brunch. We hopped in the car with no particular destination in mind, but ultimately found our way to Fig & Olive. 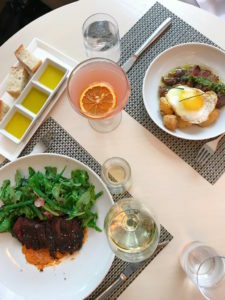 Dermel and I first encountered the posh French Riviera-inspired restaurant about three years ago on a weekend trip to New York, and were happy to learn a few months later that it was bringing its chic vibe and exquisite Mediterranean fare to the Nation’s Capital. However, we had yet to try its DC brunch. So on this most random rainy day while driving around the city on our quest to be served, we decided to finally give it a try. 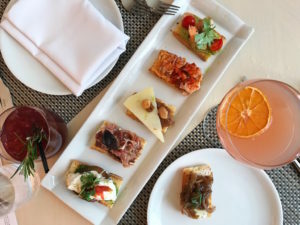 We arrived at Fig & Olive around 1:45p.m., which although considered a pretty late brunch, was still ample time to leisurely enjoy their brunch selections as the restaurant serves brunch fare until 4:00p.m. A spot on their gorgeous patio would have been ideal but the rain wasn’t having it. 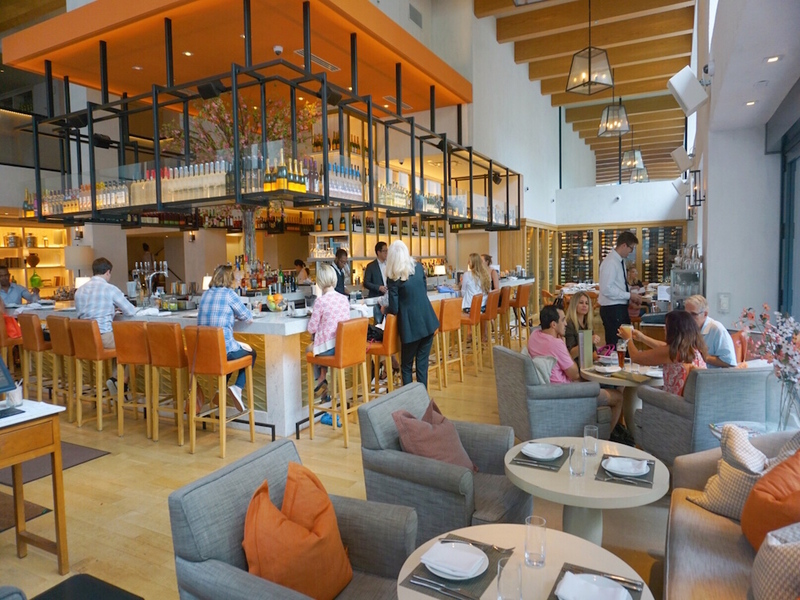 The restaurant is located in the heart of Palmer’s Alley in CityCenterDC, so on a beautiful day their patio is certainly the perfect spot to sip, savor, and scope out the city’s scene. The inside restaurant space itself is très chic, featuring a number of bright and beautifully decorated rooms. I particularly love the lounge-style design of the main area where sofas and loveseats replace traditional dining chairs making for a very homey and relaxing experience. Its magnificent ceiling to floor windows add to the already open and inviting feel of the restaurant. It has that chic coffee shop meets upscale dining kind of vibe: perfect for a laid-back leisurely brunch. We settled in at a cozy little corner nook, famished and eager to finally get our DC Fig & Olive brunch fix. 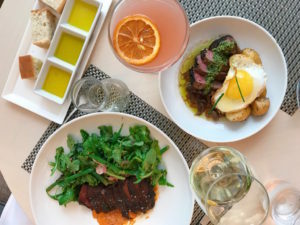 Fig & Olive serves up a medley of Mediterranean inspired dishes prepared with imported ingredients and premium quality olive oil in place of butter. 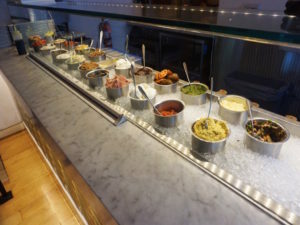 Brunch items range from light fare to hearty meals: you can find a great assortment of crostinis, crudos, fresh salads, breakfast staples like French toast and poached eggs with cured salmon or prosciutto, as well as more wholesome lunch items such as salmon burger, chicken paillard and scallop linguine. We started off with a mixed selection of their crostinis, and boy did that turn out to be the #bestideaever! At first, I was a bit disappointed when I noticed the lack of oysters on their menu. I am an oyster fiend and we had such an awesome oyster experience during our New York Fig & Olive brunch that I was looking forward to doing the same, but after just one bite of the first crostini, those oysters became a distant memory… Oyster who? The crostinis were every bit as delicious as they looked. We selected the burrata, goat cheese, octopus, shrimp, prosciutto, and manchego options. Each crostini had its own unique combination of toppings that paired together wonderfully. 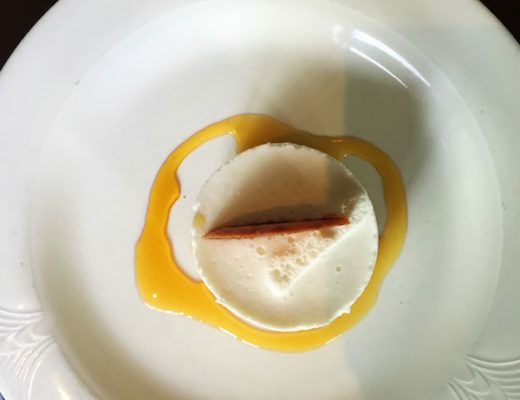 From the refreshing taste of the burrata mixed with tomato, pesto and balsamic, to the sweet and nutty finish of the manchego, fig and marcona almond combination, every bite was a magical eruption of flavors in the mouth. My favorites were the shrimp (with avocado, cilantro and tomato), burrata (with tomato, pesto and balsamic) and goat cheese (with caramelized onion and chive). 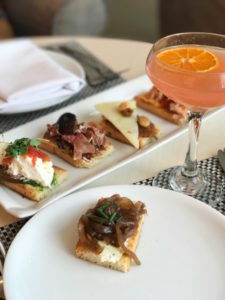 Fig & Olive offers two options for their crostinis: 3 for $13 or 6 for $22. Trust me you’ll want to go all out and get the six because just three of these delicacies will likely leave you wanting more. My choice of cocktail for the day was super easy. I was stoked to see the “Rossellini” on their brunch menu. A delightful mixture of passion fruit vodka, blood orange juice and lime juice, this beauty visits me frequently in my dreams. It’s my favorite Fig & Olive cocktail, and I highly recommend it. 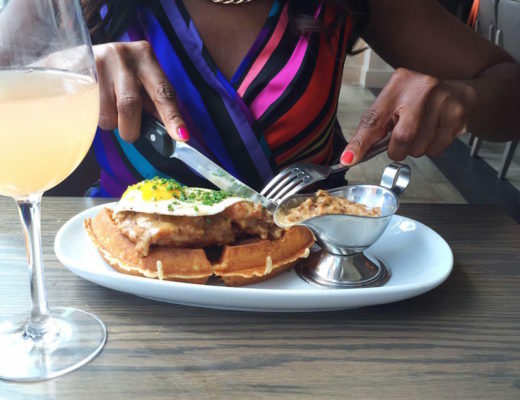 Luckily they serve it on their other menus (including happy hour) so you certainly don’t have to wait for brunch to take a swig. Dermel decided to go with the “Summer in Provence,” a more robust choice than the Rossellini. It’s a boozy concoction of muddled blackberries with gin, house made rosemary thyme syrup, and lime juice. 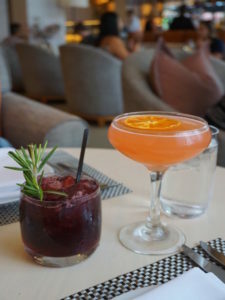 Funny enough, these were the exact two cocktails we indulged in on our first Fig & Olive experience almost three years ago. What can I say… we like what we like! Dermel did however switch to a Chardonnay (his favorite wine) once we got our main meals. 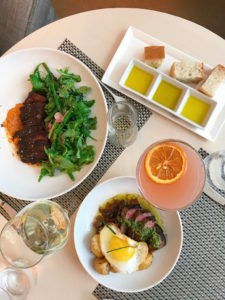 Although the drink menu is quite extensive (it features the brunch essentials like bloody marys, mimosas and bellinis, along with a great selection of wines and other refreshing cocktails), unfortunately Fig & Olive does not offer bottomless mimosas outside of their prix fixe option. In addition to their a la carte menu, the restaurant also offers a prix fixe brunch option for $29 per person. We contemplated it for a minute, but the choices were too limited for us: our eyes kept wandering all over the endless possibilities on their regular menu. Turns out we were both in the mood for meat because we each ordered the two steak dishes on the menu. Dermel got the hanger steak salad and I decided to go with the steak and egg, but we sampled each other’s meals. They were beyond delicious and the steak in both dishes was melt-in-your-mouth tender. The dishes were also more filling than they appeared at first glance, and we were both content with our meal portions. The hanger steak came with baby kale, arugula, pine nuts and romesco. If you’ve never had a romesco sauce before it’s a nut and red pepper sauce common to the Catalonia region of Spain. It’s actually more like a spread, and bares a striking resemblance to hummus. Fig & Olive makes their romesco with almonds and hazelnuts. It was rich and creamy and complemented the hanger steak nicely. The steak and egg was another great choice. 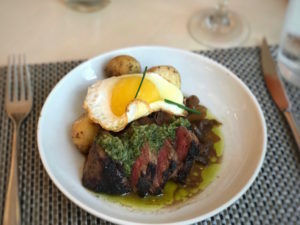 Fingerling potatoes, caramelized onions, and juicy slices of medium done steak sat in an olive oil based dish topped with chimichurri and the perfect sunny side up egg. It was not your basic steak and eggs… hands down, it was the best I’ve ever had… like EVER! With no mission for the rest of the day, we leisurely brunched. We sat for about two and half hours chatting and nibbling, sipping and laughing. Our server was very attentive and efficient and never once gave us the impression that we were overstaying our welcome. I absolutely enjoyed the laid-back, no-rush vibe. It was well after brunch time when we left. 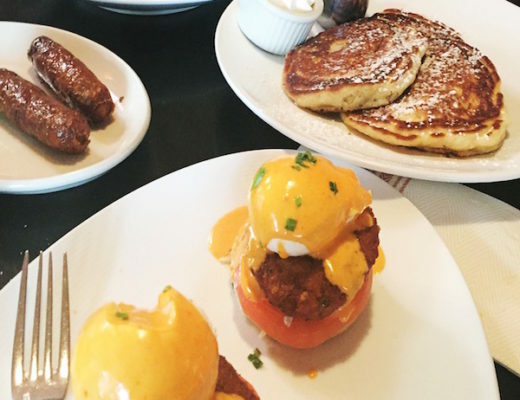 Sometimes brunch is all about pulling up to a comfy spot where you can indulge in great food and libations over seemingly never-ending conversations. The folks at Fig & Olive get it. The atmosphere there totally caters to the leisurely brunchers of the world. I guess you can say that I had my lazy day after all, and it’s certainly a bonus when it comes with super scrumptious food that you didn’t have to prepare yourself! Fig & Olive gets a well deserved A+. 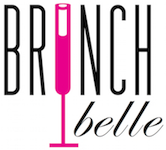 We thoroughly enjoyed everything we tasted, and I am happy to add it to my growing list of Brunch Belle Approved DC spots. It’s especially great for late risers, outdoor dining enthusiasts, group brunches, and the “all-day-affair” types who take this brunch life seriously. You can find their brunch menu here. The restaurant serves brunch on Saturdays and Sundays from 11:00a.m. to 4:00p.m. I enjoyed brunch at this restaurant approximately one month ago. Instead of finding my own words to describe it, I’ll just forward this post to my friends. Great job, Khara! Love this place!! Their food never disappoints!